So, after all this time, is Anchorman 2 just as rousing a comedic success as the first one, or does it surpass even that film’s hilarity? In all honesty, it is on equal terms with its predecessor. It’s not better, it’s not worse, it’s just on par. 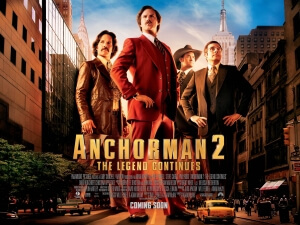 But, to be frank, that’s what we always wanted in a sequel to Anchorman: something that doesn’t really try to outdo the silly, often surreal, comedy of that film nor does it flounder when it tries to do new things and/or rehash old jokes (well, almost). It’s just more of the same stuff that we enjoyed first time round, and by God we love every demented minute of it. As a comedy, it definitely works. This reviewer has seen it twice in the cinema now, and not only laughed out loud each time but laughed HARD. Although like the first one it requires a huge suspension of disbelief for the more out-there jokes to work, it never fails to provide something in the range of 3 jokes per minute. Some more often than not don’t entirely work, but when they do it well they do it well. Like another sequel this year, Despicable Me 2, its emphasis seems to be just giving us comedic moment after comedic moment rather than forcibly push onto us a message for us to take home (though there is sort of one, but it isn’t really the film’s main focus). In terms of actual story content, it could have been very easy to make this a complete rehash of the first film’s plot with bigger and darker elements (see: The Hangover Part 2, Home Alone 2 and others) but they do try and give this sequel its own identity with its own plot and its own sense of continuity. There are definitely a few moments that do relive some of Anchorman 1’s most notable jokes – e.g. the jazz flute, Brian Fantana’s (Paul Rudd) secret closet, a cameo-filled journalist fight sequence (with some of the strangest choices of A-list actors for a good while) etc – but thankfully they don’t rely heavily on them and allow the new story to take reign without focusing heavily on the old stuff. There’s quite a lot of stuff going on this time round, which does cause the movie to lose focus every now and then. These many sub-plots include Ron and the team literally making headlines with their yellow journalism approach to their news broadcast; Ron’s relationship with estranged wife Veronica (Christina Applegate) and son Walter (an adorably irritating and irritatingly adorable Judah Nelson); Ron romancing his new African-American boss Linda Jackson (a feisty Meagan Good); a newsroom rivalry between Ron and arrogant newscaster Jack Lime (James Marsden, who does “cocky and hilarious” pretty well); Ron with his family raises and nurtures a small washed-up shark by the name of Doby; a small amount of corporate corruption involving Australian newscast owner Kench Allenby (rising Aussie actor Josh Lawson); and there’s even room for lovable dimwit Brick (Steve Carell) to romance an equally-dim co-worker, Chani Lastnamé (a hilariously dry Kristen Wiig). Keeping track? Well, you’re doing better than most people if you are. Most of these aren’t really as interesting or developed as others (Burgundy’s relationship with his son is not looked into as much, and we could probably do without the shark and corruption sub-plots) but most of the others are actually a lot of fun to watch and oddly enough feel like they belong in this sort of environment. For example, we could watch Carell and Wiig together all day and never get bored; their chemistry may seem awkward but they’re such odd characters anyway that it’s probably meant to be so, and it’s so adorable to watch them exchange their improv dialogue with each other. Brick always was and continues to be such a lovable character, and there’s something charming in seeing him connect with the only other person in the world who “thinks” what he “thinks”. As you may have guessed, Carell along with Ferrell, Rudd and David Koechner – the latter as aggressive sportscaster Champ Kind who sadly isn’t entirely used to his full potential – all slip back into their roles flawlessly, almost as if nine years hadn’t gone by the last time they played them. Their chemistry remains solid and are all individually likable, even Ron Burgundy despite his egotistical quests for fame and glory. Applegate is also back as Veronica Corningstone, and she remains a strong female presence with her own few funny moments. Sadly, other returning actors like Fred Willard and Chris Parnell are only in a couple of scenes and even then aren’t given much to do, but we can’t have everything, we suppose. It’s not a perfect comedy sequel that outdoes the original in any way, but Anchorman 2 remains on par with its predecessor and that’s possibly just as good a triumph, if not slightly better. 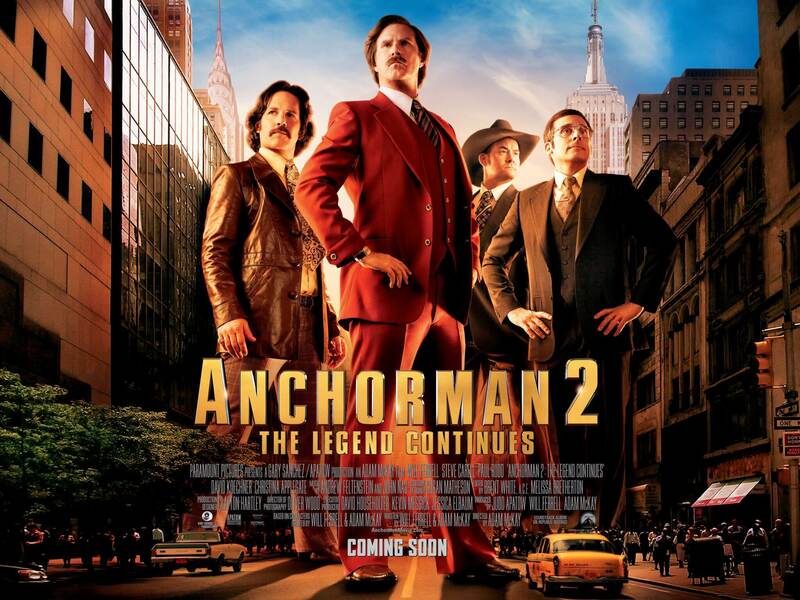 It’s a required taste of surreal humour as per its 2004 original, but Anchorman 2 is a solid comedy sequel that offers good new jokes (and some old ones, too), a good new story that doesn’t feel like a cheap rehash, and a good welcome back for popular characters like Ron Burgundy and Brick Tamland. It’s a fine news story worth reporting on.